After watching the movie, The Last Reformation, God has put it on my heart to do a serious study of the Church in the Book of Acts. It is really the only model we have been given from the Word of God about a Holy Spirit-led Church. And by what other means would we want to be led? Both History and Scripture have shown us that when we are led by men and their traditions that we get an incomplete picture of how God wants us to worship and respond to Him. The Bible plainly tells us that the Pharisees and the Sadducees got it wrong. 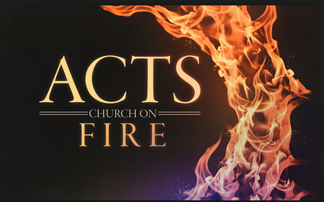 And Paul was constantly warning the small home churches to be careful of false teaching and the evil spirits that were behind the men who would try to deceive them. For centuries, his warning that there would be those who would "fall away from the faith" has haunted the Church. A careful study of history shows us that the Emperor Constantine set the stage for a wrong turn in the Church that we still haven't recovered from. Further separation emerged within the Church with the advent of different denominations -- all of whom got some aspect of Jesus's Great Commission right. But no Church has walked in the fullness of Jesus's teaching as much as the First Century Church that we see in the Book of Acts. That has made it worthwhile for me to dive deep and try to see how I can replicate that model. And it doesn't take a whole congregation to be defined as the Church. Wherever two or more are gathered, Jesus is there, and able to lead us into His Righteousness and Truth, which should be the goal of all Christians -- whether it be individually or corporately. So, let me share just a few of the precious insights I have received while immersing myself in the first few chapters of this remarkable Book of the Bible. Let me first say, that these nuggets of revelation are by no means all that is available, nor are they likely to be held by a majority of fellow Christians. But they are the ones that struck me as the most distinct from what I was taught [or not taught] in my church background. It begins in the first few verses of Chapter One in Acts. I was aware, [as verse Three tells us] that Jesus appeared for 40 days after His resurrection, teaching them the things they would need to know to carry on for Him. I had always assumed that He spent those 40 days teaching and showing them where the Prophets had proclaimed Him, and what God desired from His people. But Scripture very clearly says He spent those 40 days "speaking of the things pertaining to the kingdom of God"... not the rituals or traditions; not religion; and not just salvation. Once again, here is a reminder that it is Jesus's priority that the Disciples [and us] understand the concept of the Kingdom of God invading earth. The Kingdom of God is the domain or territory where God is King and where He rules. Right now, the perfect picture of that is Heaven. But when God sent His beloved Son to earth, Heaven came with Him. And the Parables He taught in Matthew 13 stressed how the Kingdom of Heaven operates, and were lessons on how it is to be established on earth. In short, the Kingdom of God [both in Heaven and on Earth] has been Jesus's focus -- from the foundations of the world, to the present Age, and will be into the future. Second, in verse Five of this first chapter, Jesus very clearly states that while John baptized with water, His baptism is by the Holy Spirit. John, himself, confirmed this when he said in Matthew 3:11: I baptize you with water for repentance. But after me comes one who is more powerful than I, whose sandals I am not worthy to carry. He will baptize you with the Holy Spirit and fire. I will admit that for years I labored about this distinction, because the churches I attended only talked about being baptized in water when you were ready to confess Jesus as your Savior -- not to mention the options of being sprinkled or immersed. And they never talked about being baptized with fire and the Holy Spirit. First of all, water baptism does not save anyone. It is just as John said ... it is for repentance; for recognition that you need a Savior, but the act itself does not provide salvation. And that brings me to the next points that enlightened my understanding of God's Word. In Chapter Two, Scripture says, And Peter said to them, “Repent [change your old way of thinking, turn from your sinful ways, accept and follow Jesus as the Messiah] and be baptized, each of you, in the name of Jesus Christ because of the forgiveness of your sins; and you will receive the gift of the Holy Spirit... Then they that gladly received his word were baptized: and the same day there were added unto them about three thousand souls. Here's what I see in these verses ... The Church has always proposed [and I am including myself in this] that the baptism Peter is referring to here is [only] the water baptism of John. But I am beginning to see that Peter is talking about Jesus's baptism [that which John referred to] where we will receive the Holy Spirit! It cannot be said that this could only happen while Jesus was on earth, because Scripture does not record one time that Jesus baptized. And this is not to say that water baptism is obsolete and/or has no purpose -- it is a worthy act of repentance; of confessing and dying as sinful flesh, and rising into a new identification as a Spirit-filled co-heir of the Kingdom with Christ. And, of course, Jesus, Himself, was baptized in water, but that was because water baptism was still part of the Old Covenant as a work of repentance. Secondly, everyone got baptized in the Holy Spirit the same day they repented. Why would anyone want to wait to receive the power of Heaven?!? And sometimes [as in the case of Cornelius] they received the baptism of the Holy Spirit, and then they were water baptized. It is my humble opinion that both baptisms are beneficial and show the connection between repentance and receiving the Holy Spirit. Unfortunately, through tradition and religion the modern Church only sees the picture of water baptism. I received another little nugget in Chapter Three of Acts. It came in verse 16: And His name—by faith in His name—has made this man strong whom you see and know. This is in reference to the lame man that Peter and John healed at the Beautiful Gate. All those who witnessed the miracle of healing wondered at the power that Peter and John had to heal the man. But Peter admonishes them. It is not their power, and [here is the distinction I want to make] -- it is not even by the Name of Jesus, BUT faith in the Name that healed the lame man. Peter is making sure they understand that simply saying the Name of Jesus is not a magic talisman that can be used to get what you desire. It is more than that. It is the trust and confidence in Who Jesus is, His position in Heaven, and the power and authority that He has transferred to us that allows for His work to continue here through us. And I believe that this is an important recognition that the Modern Church needs to make as we come into our newfound knowledge that there is power in the Name. It is important to know that the power comes from our faith -- our complete trust in the One whose Name we exalt. The last little nugget that I want to expound upon comes in verse 20, Chapter Four: For we, on our part, cannot stop telling [people] about what we have seen and heard. This is walking in the footsteps of Jesus. Scripture tells us that Jesus only spoke of what He saw the Father doing or saying. Jesus was a witness of the Father's actions, and Peter and the Disciples were witnesses of all that Jesus said and did. Furthermore, they sought to hear and see [in the Spirit] from the Father, just as He did. There is validity in one's teaching and words when you can give witness to what you've seen and heard. In these days, we should be seeking to hear from the Father, and seeing in our spirits what His instructions are to advance His Kingdom here on earth. If Jesus was the model for the Early Church, then He and that First Century Church should be our model. Sadly, we don't resemble them much. That's why I urge you to study and to take to heart all that the Book of Acts reveals about what the Church should look like. Then like those early Disciples, be a true Disciple of Jesus and just go do it! John 15:8 "By this My Father is glorified, that you bear much fruit and so prove to be My disciples".